[prMac.com] Tokyo - Nakahara Informatics, Inc. today released iGet Mobile(TM) 2.0.1, a maintenance release to the company's remote Mac access software for iPhone, iPod Touch and other web-capable devices. iGet Mobile gives Mac users a personal web interface to access their documents remotely, with a special emphasis on making various types of data more accessible on small-form-factor devices. iGet Mobile 2.0.1 is a maintenance release which addresses several bugs and performance issues discovered since the release of 2.0. A new Send Feedback command in the Help menu can (optionally) automatically collect system information to help diagnose and troubleshoot any customer issues. Additionally, this release introduces improved performance and several bug fixes. "Thanks to some great customer feedback, we were able to track down some esoteric problem scenarios and fix them," said CEO Christopher Martin. "This maintenance release gets that work into our customers' hands now, as we continue to work on the next major update." iGet Mobile 2.0.1 is available immediately from the company's web site. The software will run in full-featured demo mode, allowing users to try out all of its features before purchasing a license. 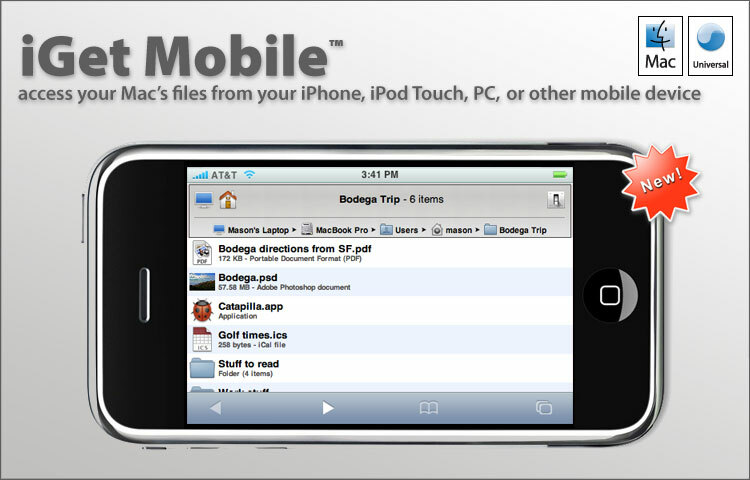 iGet Mobile was designed from the ground up using the latest Apple technologies, and it requires Mac OS X 10.5 or later. It will run on any Mac that supports this version of the OS. Regularly priced at $39 (USD), the software is currently available for the special promotional price of only $29 (USD), for a limited time. For more information, please visit the company's Website, or call (888) 550-0505. Nakahara Informatics is a technical consulting and software development firm serving clients in Japan, South Korea, Europe, and the United States. The company jump-started its line of Mac OS X application software in 2007 by acquiring iGet, the Mac file transfer tool, and quickly followed up with the award-winning version of that software for the iPhone, iGet Mobile. Nakahara Informatics, Inc. is a privately-held Delaware corporation. Nakahara Informatics, the Nakahara Informatics logo, and iGet are trademarks or registered trademarks of Nakahara Informatics, Inc. Other company and product names may be trademarks of their respective owners.